Two weeks ago, at the request of the medical institution staff, football players purchased Solar spectrophotometer for biochemical blood examinations as well as more than 50 children’s beds. Today, the Orange-and-Blacks decided to communicate with little patients in person. - I'm sure that you are the best, and the best people do the best job. You help children, which really need it. The players and I are also happy that we can help these kids. I want to say that you can always count on us. After conducting a short tour of the hospital, the players and the head coach attended the hospital rooms with children. Of course, they came not empty-handed. Small patients received soft toys, scarves, and caps from FC Shakhtar and, of course, got unforgettable experiences from communicating with their idols. - Shakhtar have been helping children for a long time. Not only in Kharkiv, but also in Donetsk, as well as in other Ukrainian cities, - said the Pitmen’s skipper Darijo Srna. Children are our future. I really want all of them to be healthy. We have gladly come here, presented the required equipment to the hospital and gifts to the kids. You saw their happy faces. Today we have done a good deed, since the kids deserve it. In the future, we will try to help as often as possible. 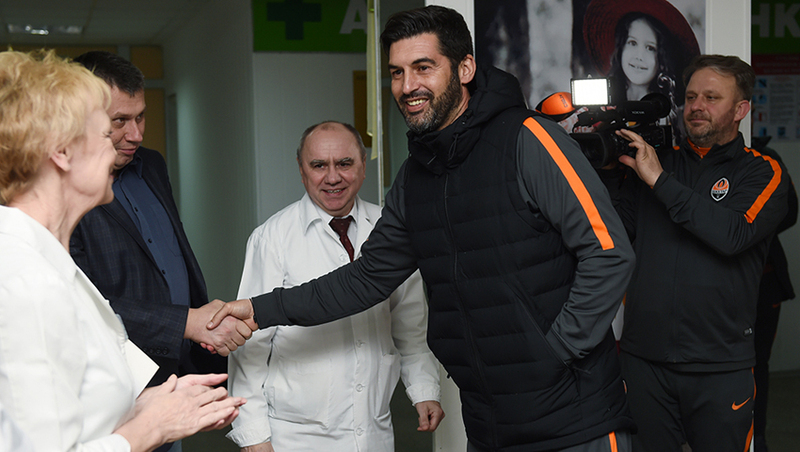 We remind you that this is not the first time when the Orange-and-Blacks visit the Kharkiv Regional Children's Clinical Hospital No. 1. Earlier, Anton Kanibolotskyi, Vyacheslav Shevchuk and Oleksandr Gladkyy sent medications to the inpatients at the medical institution.